Travel back to a time when two thirds of Americans lived on farms or rural villages. Indoor plumbing was rare and homes were heated by sooty wood burning stoves and kerosene lamps. Work was physically difficult and accidents happened often. Serious diseases like cholera, yellow fever, typhoid fever, diphtheria, malaria, and tuberculosis are common. These are difficult conditions for a rural “country doctor” with no vaccines, no laboratory tests, and not many effective medicines. They were responsible for treating a wide range of medical problems including broken bones, wounds, chronic conditions, and acute sickness. Surgery was often left to the work of city or hospital doctors when it couldn’t be avoided. Treatments were almost exclusively done in the patient’s home. By the late 1800s, bleeding as the main form of treatment had fallen out of favor for most practitioners. (See YouTube video here.) Treatment now was mostly prescriptions combined with instructions for rest and diet (broths, gruel, warm or cold drinks). Warm baths, topical applications of medicine, wraps, and gargles were common. Any medicine that was given was applied topically to the affected area or dissolved in liquid like tea. (Injections of medicines were not common until physicians learned to make sterile solutions. Pills were difficult and time consuming to make.) Medicines were often prepared by the physician in small towns where pharmacies were not available. In this time before antibiotics*, medicines were often given to treat the symptoms of the sickness, not the sickness itself. 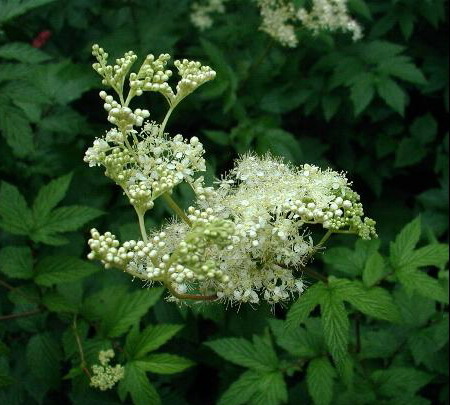 For example, there were many pain relievers (opium, morphine, Phenactine, and Acetanilid) and some antipyretics (fever reducers like willow bark and meadowsweet). Cathartics from a variety of plants were used to accelerate defecation and cleanse the lower GI tract. Opium could be used to counter diarrhea. 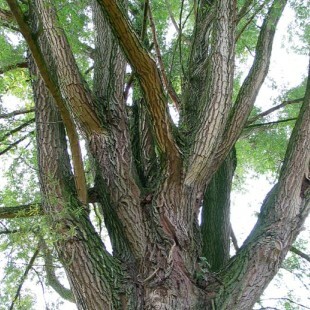 Camphor was used to soothe itchy skin. Mild antibacterials such as Resorscin and camphor would be used over wounds to prevent infection. These medicines were used to make the patient comfortable and to prevent complications (dehydration, constipation, high fever, etc) while the illness ran its natural course. 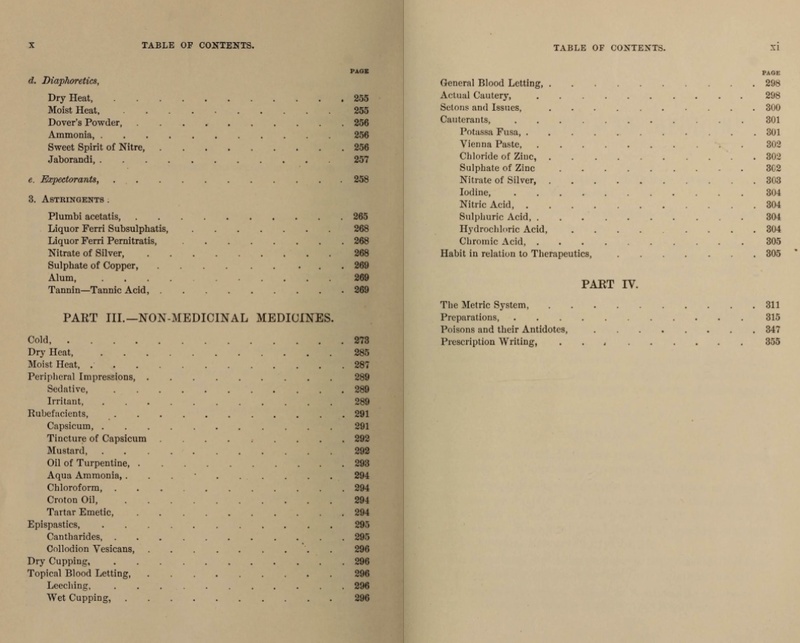 Medicines were further divided into Disease and Symptom categories. Symptom medication was discussed above. Disease medication was different in that it worked to treat the disease instead of the symptoms. 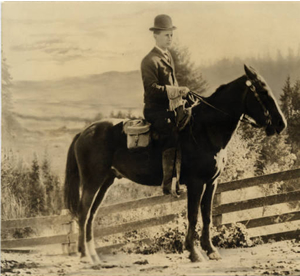 The effective medicine available in the late 1800s was mostly used for chronic diseases or, as Dr. Thomson put it “faults in the constitution, either inherited or acquired.” These medicines usually required repeated doses to be effective. Restorative medicines in this category acted to make up deficiencies in the body. For example, iron is given for anemia. Alternative medicines were often small doses of agents that could be poisonous and the patient’s reaction to the medicine had to be watched carefully. For example, colchicum was given for gouty arthritis. The efficacy of these drugs was not well understood at the time. 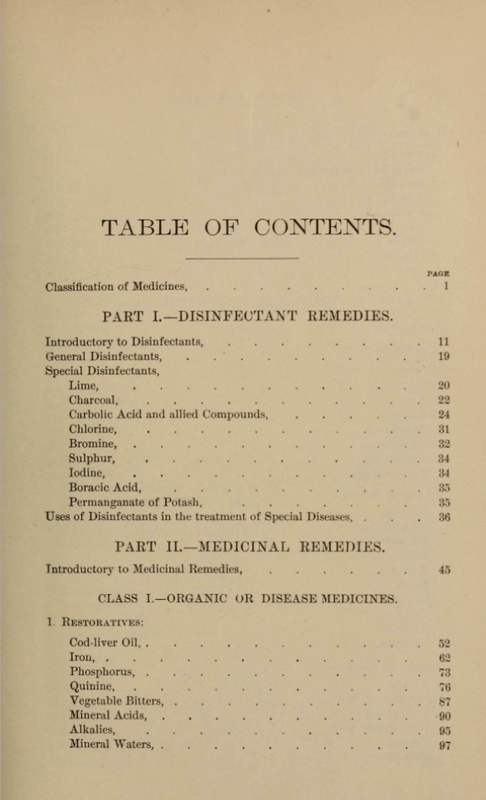 The third category of therapeutics was disinfectants. This small group of medicines were used in the prevention of communicable disease. New research had shown that some illness were caused by living organisms that were visible only under a microscope. These diseases could be prevented or cured by killing the organism or stopping its growth in the body. 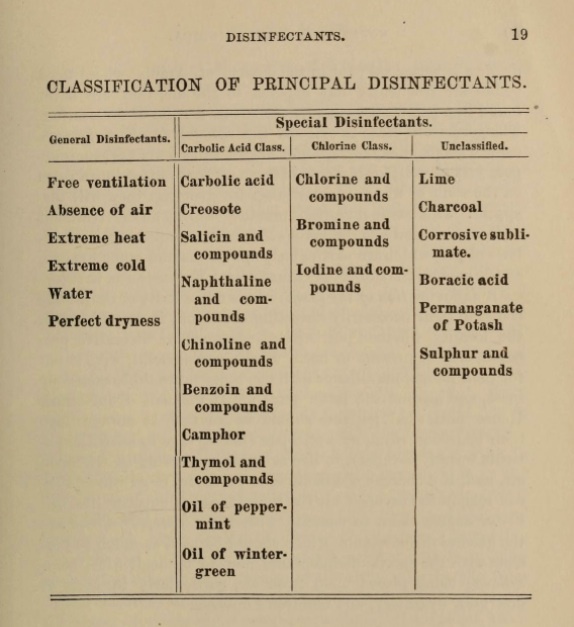 The main disinfectants were carbolic, chlorine, lime, charcoal, and sulphur. The method of treatment for similar illnesses could vary between doctors due to the fact that medical education was largely unregulated and so was the drug manufacturing industry. The cause of many illness were not well understood. Each doctor, therefore, had his preference for treatment based on their experience and not necessarily through medical research. It was not uncommon that patients would try home remedies before they called the doctor, which in some cases complicated the illness. *Prontosil (1935) was the first truly effective medicine to treat a range of infections inside the body. It led the way for the antibiotic revolution in medicine. Bordley, James III and A. McGehee Harvey. Two Centuries of American Medicine, 1776-1976. Philadelphia: Saunders, 1976. Print. Blanchard, Charles Elton, ed. Dr. Betterman’s Diary. Youngstown: Medical Success P, 1937. Print. Rathbun, Dr. A.J. A Friend in Need, or the Little Doctor. Youngstown: Arens and Kerr printers, 1894. Print. 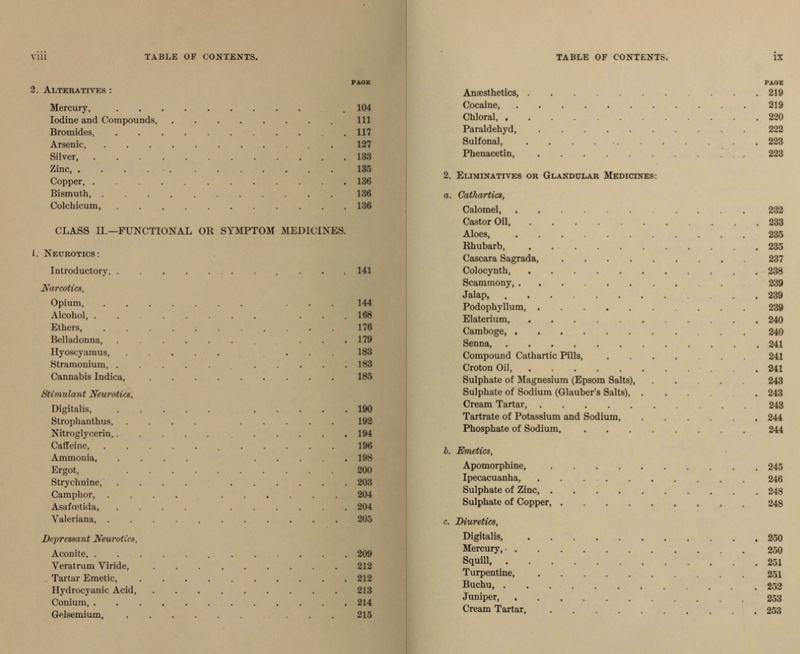 Thomson, William H. Notes on Materia Medica and Therapeutics: taken from lectures delivered. William H. McEnroe, ed. New York: Trow, 1894. Print.